A fast 50ppm print capability allows quick output which, combined with the versatility to handle extra paper trays and 4 bin mailbox, makes the HLL6400DW an invaluable recruit to any team. 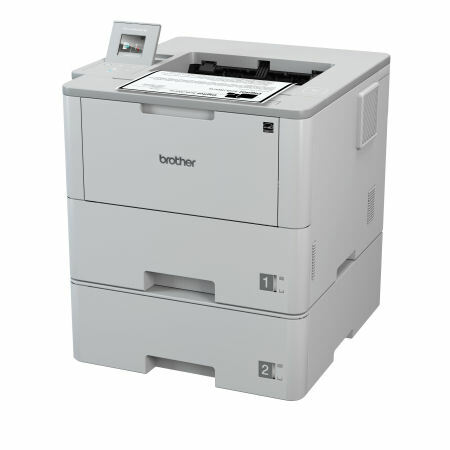 Designed for medium and large workgroups with demanding print volumes of up to 10,000 pages monthly, who are looking for low cost printing and business reliability. Realise a low total cost of ownership due to its ultra-high yield toner, which prints up to 20,000 pages. Maximise your productivity with a large, 520-sheet standard input tray. Scalable to fit virtually any office, add either optional trays to increase capacity to 1,610 sheets or transform this printer into a floor-standing model with the tower tray option (520 sheets x 4 trays). The HLL6400DW also has near field communication (NFC) capability for mobile print and card authentication, along with a host of other advanced security features. It supports seamless workflows, with multiple business cloud based services including Dropbox and Google Drive. · Ink/Toner TN3415 - 3,000 pgs @ 5% coverage. TN3425 - 8,000 pgs @ 5% coverage. TN3465 - 12,000 pgs @ 5% coverage. TN3475 - 20,000 pgs @ 5% coverage.